A collaboration between the Spithead Masons and the British Heart Foundation has led to a new Defibrillator being installed in Seaview. Seaview has a new Defibrillator. Located on the East wall of the Masonic Hall, Fairy Road, it’s a collaboration between the Spithead Masons, who purchased the Defibrillator and paid for its fitting, and the British Heart Foundation, who donated the cabinet it’s held in. 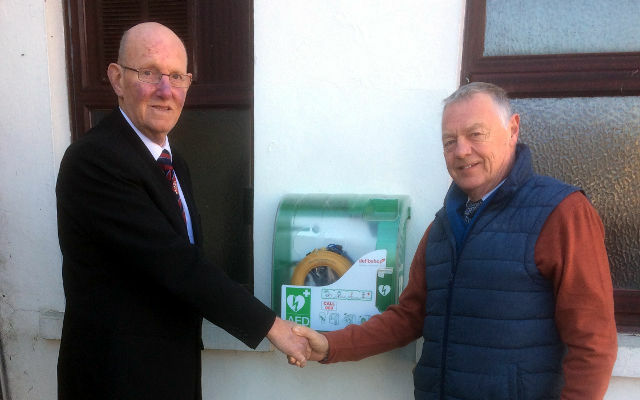 In the photo above Bob Cooper, Secretary of the Spithead Masonic Lodge, introduces the now-publicly accessible defibrillator to Cllr Barry Elliott, vice chair of Nettlestone and Seaview Council.